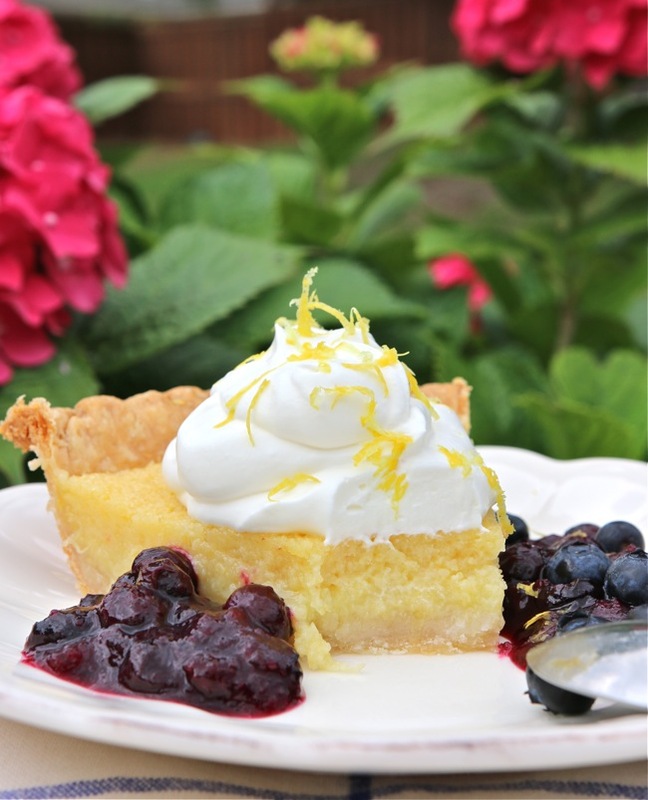 Lemon Chess Pie from ThePieAcademy.com – a smooth-as-silk lemon custard pie that’s fabulous on its own or with your favorite summer fruit. What’s your idea of the perfect summer pie? A glistening fresh strawberry pie with a hint of spice? A jumble of mixed berries in a flaky butter pastry? 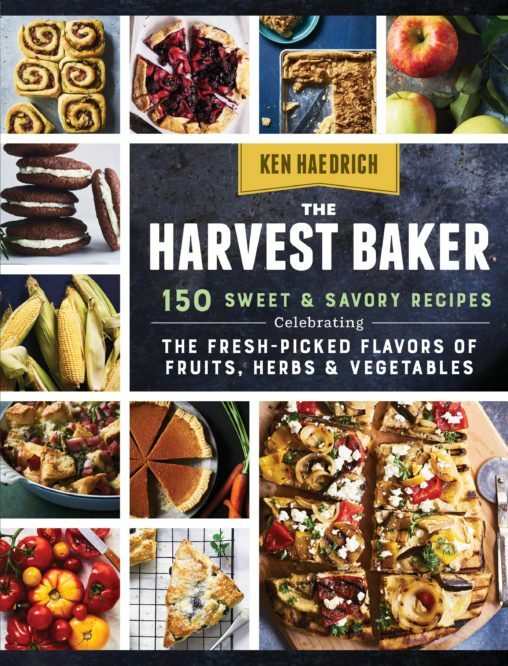 How about sweet peach, apricot, or nectarine? They’re all wonderful, aren’t they? But there’s another summer pie you should add to that list, not a fruit pie but one that any of your favorite summer fruits can happily share the spotlight with. It’s called lemon chess pie and if you’re not already a fan, you soon will be. 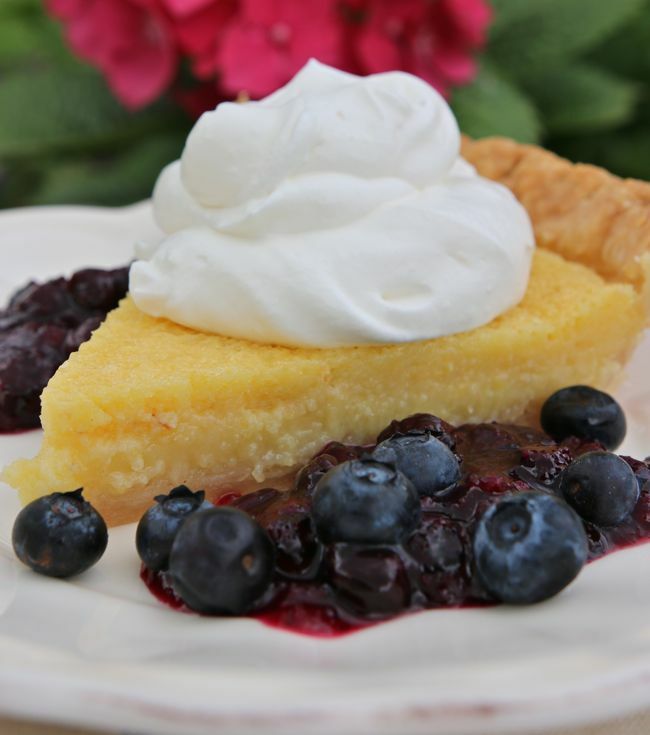 Another clue to its southern roots is the cornmeal thickener, which gives this pie its unique texture. It’s something like a cross between a lemon curd and light lemon custard, but with an ever-so-slight and agreeable graininess from the cornmeal. It’s delectable – soft, sweet, and delicate. The filling is unequivocally lemony, not unexpected in a pie that calls for lemon juice, lemon extract, and lemon zest. It’s the smooth, silky lemon flavor that makes this such a good partner with virtually any summer fruit you care to serve it with, from blueberries – like we do here – to late summer peaches. While we’re on the subject of lemony things, if you’re still messing with a box grater to remove zest you’re using the equivalent of a stone age kitchen gadget. The larger holes of a box grater are fine for many cheeses. But the small holes – or, worse yet, the surface with those tiny raised perforations – tend to turn lemon zest into lemon goo, or inexplicably make it disappear altogether. What you need is a tool called a Microplane Grater-Zester, like the one shown here (and available in most kitchenware stores.) 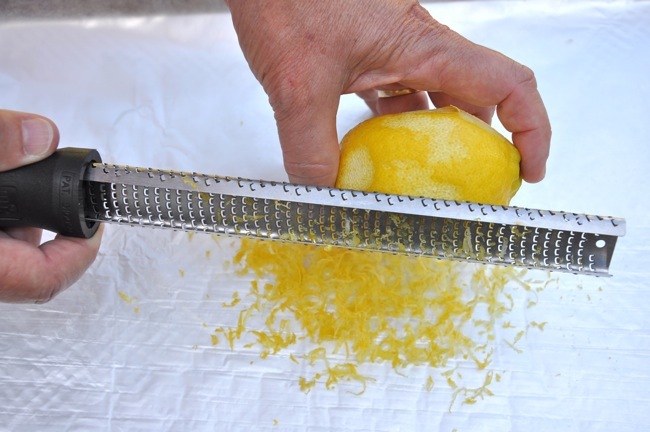 You simply hold the lemon steady in one hand and slowly draw the business side of the Microplane across the surface. Tap the blade on your work surface, and out falls beautifully separate strands of zest. Works perfectly on hard cheeses, too. One last thought: this is essentially a custard pie, so don’t bake it above 350°. Custard-type pies don’t like temps above that, but they’ll do fine a little cooler – like 325° – if you’re uncertain about your oven or the temperature fluctuates a little. Lower and slower is almost always safer and smarter where pie baking is concerned, especially when there are eggs in the filling. Enjoy! Since announcing the details just ten days ago for our upcoming Lowcountry Pie Getaway in Charleston, South Carolina, quite a few of you have signed up so we’re nearly half full. Many more of you have requested registration forms. This is great news and, frankly, we expected an enthusiastic response from Pie Academy members and their families and friends. 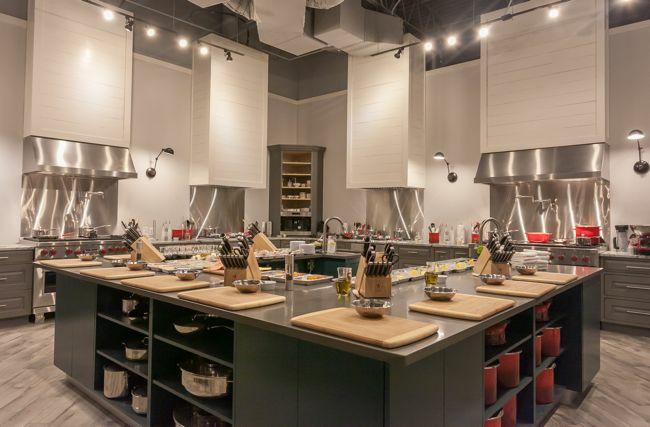 Charleston is the epicenter of irresistible regional cooking, so what better place to spend a long weekend baking pies in the company of new friends, surrounded by the beauty and charm of the south’s Holy City? If you’d like to receive a registration form, please let us know and we’ll email one to you right away. If you already have a registration form but haven’t returned it yet, we hope you’ll do so as soon as possible and take advantage of our ‘Early Pie Bird’ pricing that ends June 17th. Like we said earlier, once we’re full, we’ll have to pull the plug on registrations in order to maintain the intimacy of our group and opportunities for individual attention and instruction. One of the nicest surprises I’ve had running The Pie Academy is how many men I hear from, hobbyist bakers who dedicate a portion of every week or month to making pies from scratch. They often tell me that they relish this break from their weekday work. If your own father happens to be a pie maker, we hope you’ll consider gifting him with something from our Pie Academy store. 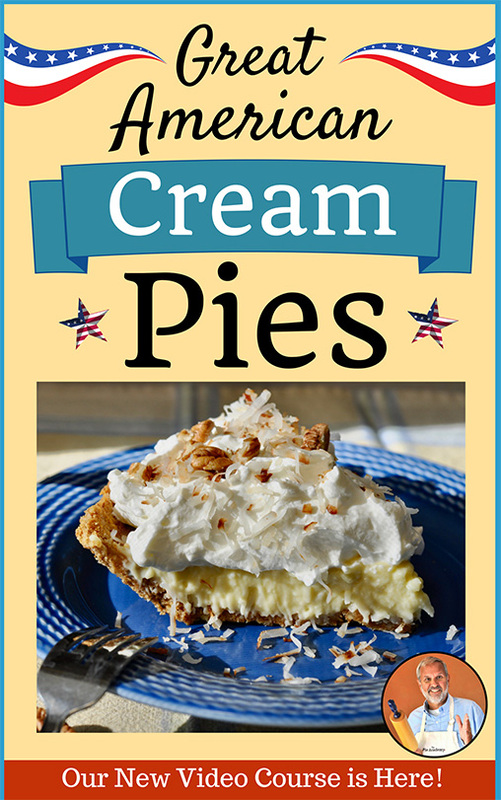 An autographed copy of my bestselling book PIE would be a good start. Our embroidered aprons are always popular with pie makers, and our gorgeous cherry or maple engraved Pie Academy rolling pins perform like a charm. If you place your order by Tuesday, June 15, it should arrive in plenty of time for Father’s Day. 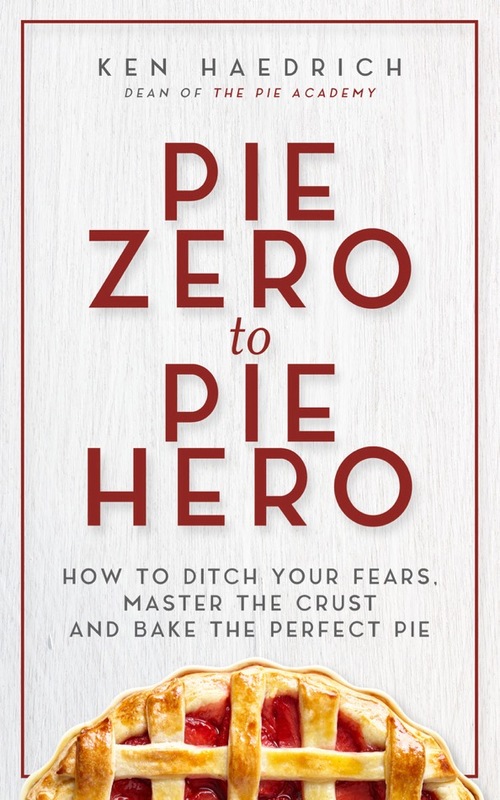 And don’t forget The No-More-Tears Pie Pastry Course, our video training that’s helped more than a hundred Pie Academy members up their pie game. The great thing about this training is that you can watch the videos over and over, at your own pace, until you’ve mastered the essential pie making skills. 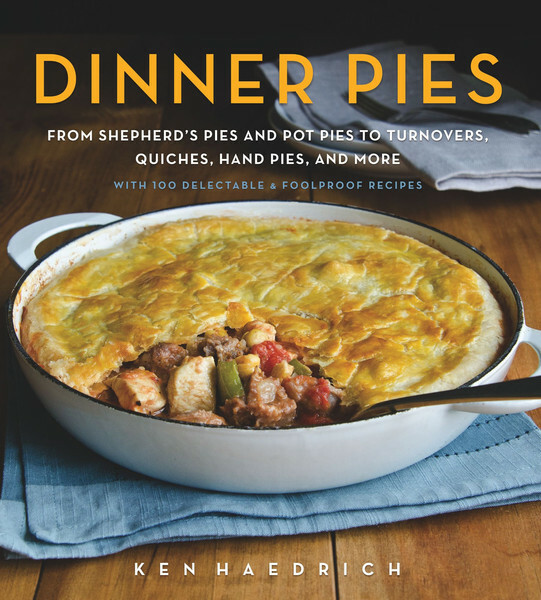 It’s the perfect gift for any pie maker. Thanks. PASTRY NOTES: This pie is easy to make, but it’s still refined and refreshingly subtle. So the filling goes best with a basic pastry that won’t detract – or distract – from the filling. (This isn’t the place to try out your new crunchy quinoa and caraway seed crust.) So stick with one of our old reliable pie crusts like Good Basic Pie Dough or Food Processor Pie Dough. On a sheet of lightly floured wax paper, roll the dough into a 13-inch circle. Invert the pastry over a 9- or 9 1/2-inch deep-dish pie pan - the pan doesn't have to be overly deep, as there's a moderate amount of filling, not an overabundance - center it, then peel off the paper. Gently tuck the pastry into the pan without stretching it. Sculpt the overhanging dough into an upstanding ridge. Flute if desired, then refrigerate for at least 1 hour. Bake the shell on the center oven rack for 25 minutes. Slide it out and carefully lift out the foil and beans. Re-poke the holes if they've filled in. Slide the shell back in and bake another 5 to 8 minutes. Transfer to a rack and cool. (Once cooled, dab a little cream cheese on a fingertip and plug the holes to avoid leaks.) Set the oven to 350°. Combine the sugar, cornmeal, and salt in a large bowl. Whisk to combine. Add the eggs and yolk. Whisk well. Whisk in the half-and-half or milk, melted butter, lemon juice, lemon zest, lemon extract, and vanilla extract. When the filling is smooth and thoroughly blended, slowly pour into the cooled pie shell.